Manage and Index Large Document Repositories With Ease! E-Reserves & Document Management is an add-on module to LibGuides or LibGuides CMS. Deliver point-of-need documents and drive up usage with robust LibGuides and Courseware integration. Enjoy flexible content organization, enhanced security features, and copyright management - everything you need to manage document repositories at scale. The Most Cost-Effective E-Reserves Solution. Create and manage OER Repository. Statistics Show Document Usage Details. Increase usage by integrating E-Reserves & Documents right at point of need with statistics that back you up. 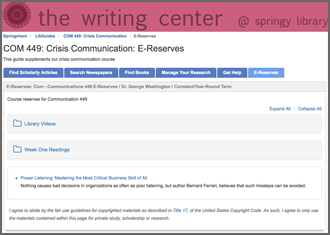 Adding relevant E-Reserves at the guide-level allows students to find everything they need in one place - expert guidance from you and key reserve materials for their class. It's a win-win. Embed relevant course-specific content right inside a Blackboard, Moodle, Canvas, or any LTI-compliant courseware tool. Students benefit from direct access and you get detailed stats. Distribute documents and embed them anywhere with customizable widgets. Manage documents centrally, yet easily distribute them anywhere at the point-of-need. Get out of the email/spreadsheet rut and funnel requests and manage permissions natively. Faculty and users can submit E-Reserve / Document requests that when approved are auto-populated right into your system. The Smart Form only reveals fields as they fill it out. Ensure copyright compliance with a customizable copyright statement. Track and manage the copyright status of items so you'll always know the appropriate permissions. Enter assets once and reuse it again and again. Mapped assets only need to be updated once and watch those changes cascade down to everywhere it’s been reused. View usage statistics for any document in the repository - how many times it has been accessed for any specified time period. The detailed statistics help you track and evaluate how the content is being utilized. Whether you use the system for E-Reserves, an OER repository, or as a general document management system, the detailed statistics will deliver the data you need. Ensure copyright compliance with robust access controls that do the work for you. Add course/item level passwords and IP-restrict individual assets. Need to route your entire E-Reserves through authentication? We've got that covered, too. Automated visibility controls ensure that content is only accessible when you want it to be. Take the onus off yourself and let automated visibility dates do the work for you. Uploaded files are stored securely on our servers and can only be accessed from within. This ensures copyright compliance with your purchased content.